Waqar Younis’ bowling is just unmatchable! In fact, many batsmen feared to face his deliveries. There’s hardly anyone who can break the records set by Waqar. He also tried his hands on commentary and did really well. Waqar is quite active on social media and has a huge fan following. After batting, he keeps impressing people with his words & good deeds on Twitter. His recent tweet is a proof of his politeness and kind gesture towards India. Waqar took to Twitter to deliver a peace message between India and Pakistan. 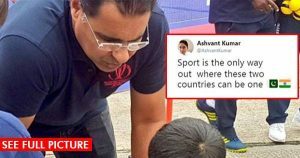 Yes, he posted a pic on Twitter in which he is seen interacting with a small boy wearing a “Pro India” jersey. The message on the jersey read, “Yeh dosti hum nahi todenge”. Wow, this is a brilliant message for all Indian and Pakistani fans. People loved his peace message and appreciated him. Really appreciate to see this comment. People like you will surely bring harmony and peace to both ends ONE DAY… IN SHA ALLAH.